Communities are a great way for groups of people to share around a topic. But when you’re creating a Community for a group you’re a part of, like a book club, parent-teacher association, or work team, the last thing you want to have to do is invite each member one-by-one. Since so many groups already have a way to get ahold of one another, whether that’s through email, chat, a newsletter or something else, we’ve created a new Community invite link so you can invite all the right people at once. With the Community invite link, Community owners and moderators can share an invite link with their group however they choose. People with the link will be able to directly join both private and ask-to-join public Communities, and anyone who doesn’t have a Google account or Google+ profile will be able to create one along the way. Communities that are restricted to a given G Suite organization will continue to only be accessible to members of that organization. If something changes, you can easily disable a shared link or generate a new one at any time. 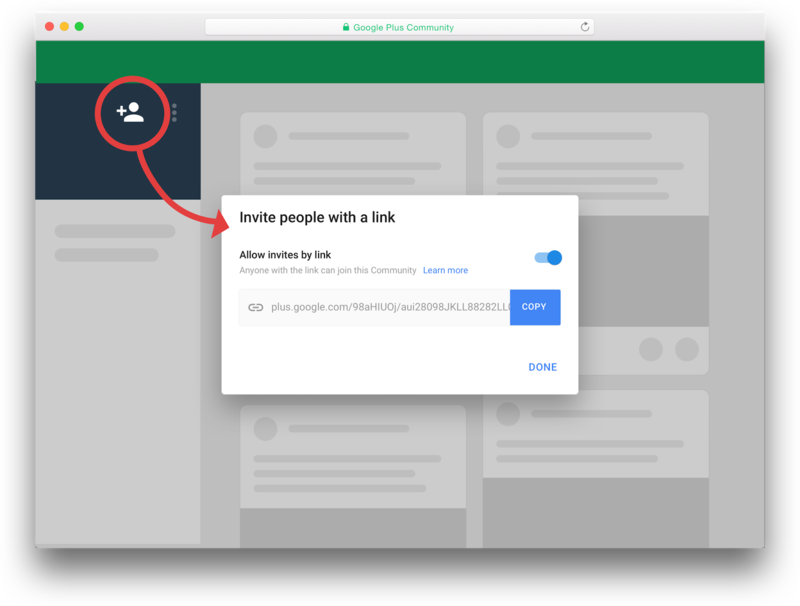 To share an invite link to your Community, just open the invite menu on Google+ web, turn on the “Allow invites by link” option, and grab the link that appears.